If you have always wanted a straighter smile but did not want to deal with the hassle or appearance of metal braces, you now have an alternative option. You can get a straight smile without the use of traditional braces using Invisalign. Invisalign has quickly become the preferred orthodontic treatment among teens and adults because it offers an invisible treatment that does not require metal brackets or wires. At Friendswood Dental Group, we offer Invisalign in Friendswood to give you a straight smile. Invisalign offers an alternative to traditional braces without the use of metal wires and brackets. Instead, custom-made aligner trays are created to move your teeth into their correct positions. 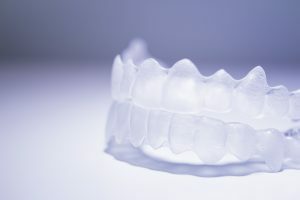 The aligner trays are created in a series, which are worn over the teeth. Each tray in the series is worn for about two weeks, at which point you are able to switch to the next tray in the series right from home. It takes about 12 months on average to complete the series. At the end of the treatment you will have a straight smile. To prevent your teeth from moving back into their previous positions, you will require the use of a retainer. When compared to traditional braces, Invisalign offers exceptional benefits. The trays are clear, so no one will notice you are undergoing an orthodontic treatment. In addition, the absence of wires and brackets means you will not experience tugging or pulling on the teeth. Plus, there is no irritation to the inside of your lips or cheeks. You will also enjoy easier oral hygiene and no dietary restrictions since wires and brackets are not used. Overall, you will have a quicker, more comfortable, and less noticeable treatment. Invisalign is proven to provide the same high-quality results as traditional braces. However, there are certain limitations. Invisalign is not suitable for those who have severely rotated or tipped teeth. In addition, those with severe overcrowding or exceptionally large gaps cannot use this treatment. Invisalign cannot be used to treat certain bite complications. To determine if you are a candidate for Invisalign, your dentist in Friendswood will need to perform a consultation. If it is decided that Invisalign is right for you, we will create a comprehensive treatment plan to start the road to a straight smile. At Friendswood Dental Group, we proudly offer Invisalign to our patients who want a straight smile without having to use traditional metal braces. In addition to the traditional Invisalign treatment, we also offer Six Month Smiles for those who are not candidates for Invisalign. Six Month Smiles uses a similar method to traditional braces, however, you will enjoy a less noticeable treatment as tooth-colored brackets are used. If you are interested in getting a straight smile, we will perform the consultation needed to determine which treatment will best meet your needs. Contact our office to schedule a consultation today with Friendswood Dental Group.